Petplan Equine, proud sponsors of the Area Festivals for 20 years, understands that in the event of any illness or injury you want to give your horse the best possible care and get back to achieving the best scores you can in the dressage arena. That’s why we pride ourselves on offering quality products and a great claims service. 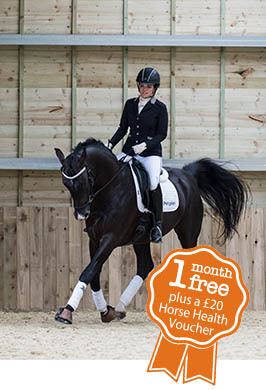 This exclusive offer to British Dressage members is valid until 31st December 2019 for Horse Insurance and Veteran Plan policies. Click here Terms and Conditions. Buy Horse Insurance Whether you're a first-time owner or a serious competitor, our horse insurance policy allows you to tailor your cover to suit your individual needs. Select from a variety of optional benefits. Buy Veteran Plan Our veteran insurance policy is for horses aged 17 to 40. Veteran Plan offers a variety of benefits such as: Vet Fees (for injuries), Third Party Liability and Personal Accident cover for both horse and rider.